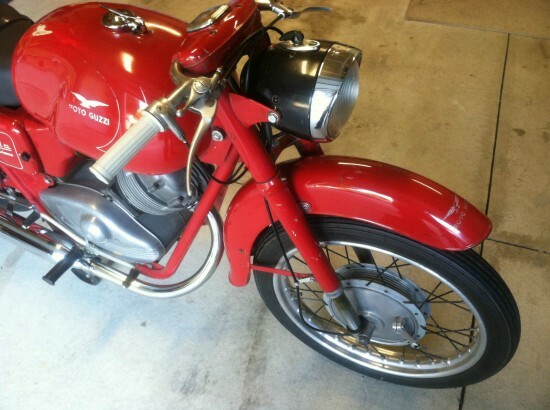 The Lodola [“Lark”] was yet another of Moto Guzzi’s practical, bird-themed motorcycles and was the very last machine designed by Carlo Guzzi himself. 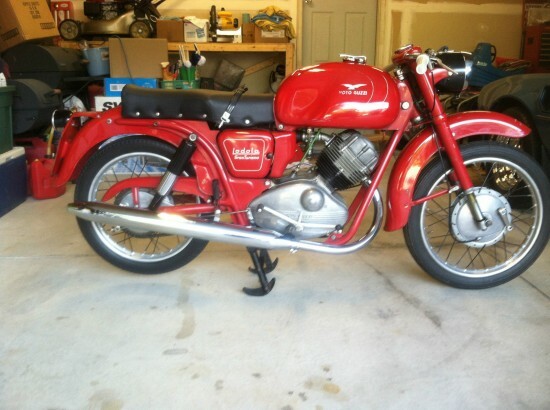 Although the seller refers to it as a “very nice example of [an] early 1960’s Italian motorcycle”, it was actually introduced in the mid 1950’s. First produced as a 175cc machine in 1956, it featured a chain-driven overhead cam with dry-sump lubrication and an engine canted forward at 45°. 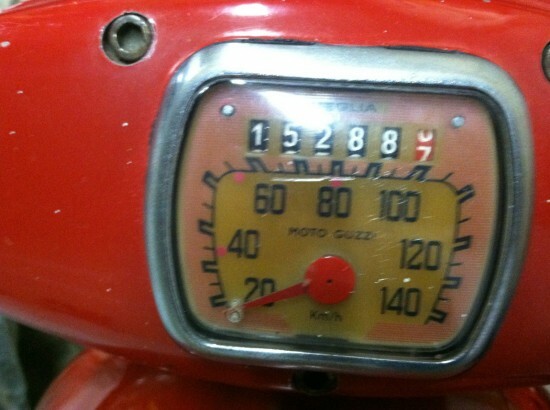 This example is the later, 235cc “Gran Tourismo” version introduced in 1959 and sold through 1966. The larger version actually went from an overhead cam to pushrod actuation for the pair of valves, an interesting step backward in terms of specification. Overall, the machine was slightly slower than its more sophisticated older sibling, but had a much more flexible powerband suited to the bike’s plebeian intent. It was also produced in much greater numbers and proved to be a popular machine, with period reviews commenting on its civility, efficiency, and general competence. 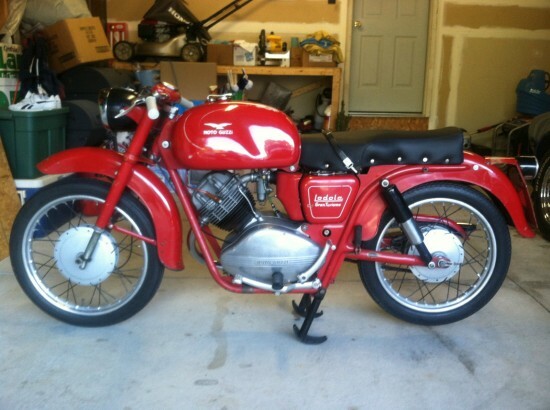 A very nice original example of early 1960’s Italian motorcycle. It has some normal wear that you would expect from a 53 year old motorcycle but overall in great condition. It’s all there including the original key. It has a new silencer on it that is not the original but is the style of the original that came on it. There is a small dent on the tank and the inside is starting to develop a little surface rust that you can detect with your finger just inside the cap. I rode it for five years on weekends or just around town on local trips. It has been parked and covered for the past two years in a heated garage. It will start but the clutch plates have stuck together so that will need to be addressed by the purchaser. I am told this is a common problem that comes from the age of the motorcycle. It’s a great motorcycle to ride, very light and responsive. It has a great patina which kept me from doing a full resto on it as I thought it was just as nice the way it is. It does not smoke or knock when running, just the usual exhaust note of a single cylinder motor while running. Photos in the listing aren’t the greatest, but it’s pretty clear what’s on offer here. 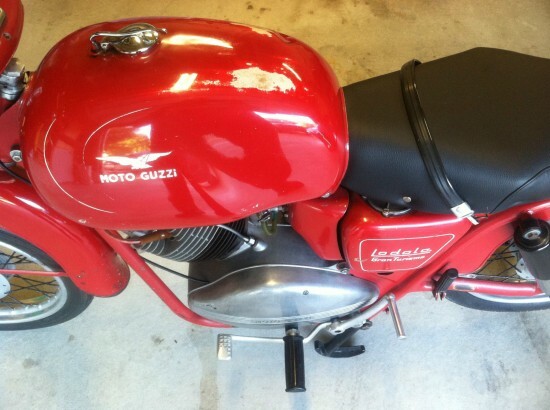 It’s nice to see that, other than a couple years of sitting, it’s been well-used and enjoyed as Guzzi intended. As with most of these small-displacement Italians, the Lodola was, excepting racing and offroad specials, a practical, stylish commuter bike that stressed efficiency and reliability. Anyone looking for something small and fun to add to their collection now can certainly appreciate these qualities, as parts for anything this old can be a bit of a problem and if you’re going on rides to nowhere for no good reason, it’s nice to know you aren’t wasting too much dinosaur juice doing it. I have no space at the moment to add something like this to my garage and the roads near me aren’t really friendly to small motorcycles like the Lodola, but I hope that someday to own a fun little Italian single like this one.